Welcome to PrimeBiz Hotel Kuta, an award winning midscale hotel in Kuta for business and leisure. Conveniently located just 5 minutes near the Ngurah Rai International Airport in Bali and situated on Jalan Raya Kuta, this Kuta hotel is near to myriad of restaurants, Joger souvenir shops, Krisna Oleh Oleh, factory outlets and water park. Less then 10 minute taxi ride to the famous Kuta Beach and Kuta's shopping/entertainment street. Bali Mandara Toll Road is just few minutes away for easy access to Nusa Dua, Sanur and the other part of the island. 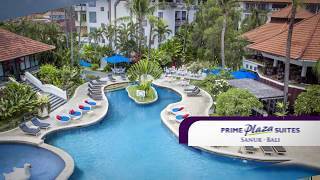 Being one of the leading business and leisure hotels in Kuta, PrimeBiz Hotel Kuta offers comfort, convenience, high standard of service and best value for money for your leisure and business needs in Bali, Island of the Gods!